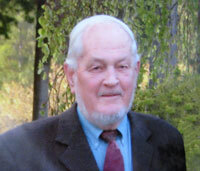 His family is extremely saddened to announce that Ken died suddenly on Saturday, August 13, 2011, at age 86. Ken lived in Burnaby and frequently commuted to UBC by inter-urban, streetcar and bus. He was a member of Beta Theta Pi fraternity, which he represented in athletic and musical activities. He received his MDCM from McGill University in 1950. Upon returning to the west coast, he interned at Vancouver General Hospital and did his residency in orthopaedic surgery. One year of his training was spent in Dr. Sydney Friedman’s Anatomy department, leading to his MSc. He received his FRCS(C) in 1955. For 40 years, in addition to his private practice, he taught orthopaedics in the UBC Faculty of Medicine. For 11 years he was the head of the Division of Orthopaedic Surgery and after retirement, he became a member of the professors emeriti. For the past 18 years, he enjoyed living in Gibsons on the Sunshine Coast. He was a wonderful husband and father. Though his work life was very demanding, he protected time to spend on family activities, especially in cottages on Howe Sound islands. His wide range of interests was contagious, enriching family and friends. Ken had a strong involvement with art and artists. Other interests were music and all aspects of nature. He was also a prolific reader and writer on numerous topics. As well as innumerable medical articles, he wrote biographies, journals and poetry for personal satisfaction and family information. Ken was always modest, never accepting the limelight. It has been, therefore, extremely gratifying for the family to hear from so many people what a wonderful and amazing man he was. He deeply touched many people, even some who knew him only briefly.